INGEAR provides a variety of PLC driver software solutions to serve several different controller brands and protocols. From .NET products to OPC Servers, INGEAR has the software you need to help cut costs and drive efficiency in your processes. Direct communication pipeline from Visual Studio.NET to Allen-Bradley, Modbus, GE-Fanuc and more without OPC servers or RSLinx. 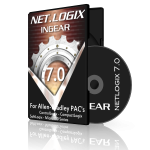 Industry-leading Allen-Bradley OCX driver for legacy Visual Basic 6.0 applications. Low-cost OPC server software providing OPC standard connectivity for Modbus, Omron, Allen-Bradley and GE-Fanuc. Explore our selection of drivers and browse by controller brands and protocols to find the solution that best fits your requirements.